Directed by Patricio Guzman, The Battle of Chile Pt. 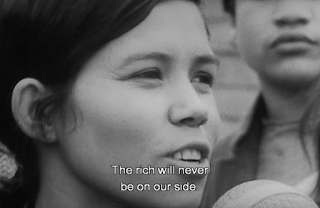 2: The Coup d’etat is the second part in a trilogy of documentaries that explore the 1973 coup d’etat in Chile led by Augusto Pinochet against Salvador Allende. The film showcases the events leading to the coup following its first attempt in late June and how it would be successful as well as the horror that would impact the country for nearly two decades. The result is a fascinating yet visceral film from Patricio Guzman. Picking up where its predecessor left off, the film chronicles the ten weeks of the summer of 1973 in Chile during a period of social and political unrest under the rule of its president Salvador Allende. The film, that is narrated by Abilio Fernandez, showcase the events that begins with the June 29 coup attempt as well as the attempts for a peaceful resolution between Allende and the more conservative Christian Democrats. During the course of the ten weeks, director Patricio Guzman and cinematographer Jorge Muller Silva (whom the film is dedicated to just like its predecessor) would film the many events that is happening including more protest marches and meetings that showcase the political disarray between the working class and poor against the middle and upper-class. With this usage of hand-held cameras in black-and-white footage that include some TV footage collected by editor Pedro Chaskel. Guzman chronicle many of these events that include a strike from trucker owners driven that was partially funded by the CIA who would be instrumental in the coup d’etat on September 11, 1973. Guzman would also go in the middle of the marches and protests talking to regular people as well as showcase footage of the growing tension including brief moments of peace talks that included a funeral for naval officer Arturo Araya was assassinated by right-wing extremists as it set the tone for what is to come. With some wanting Allende to resign or to transfer power to the Christian Democratic-led congress, Allende would refuse as he would try to create another vote for September but that would all change on September 11, 1973. The sound work of Bernardo Menz would capture the sounds of protests and violence including the film’s climax that feature footage of the coup d’etat on September 11, 1973. Most notably Allende’s final speech before he would kill himself at the Presidential palace though it was reported that he was killed by either gunfire or bombs from the jets attacking the palace. Featuring pictures including some of the last pictures of Allende hours before his death, Guzman would reveal the chaos of that day and how it would affect Chile in the course of twenty-four hours with Augusto Pinochet and members of the junta talking about the end of three years of Marxism in the country. The Battle of Chile Pt. 2: The Coup d’etat is an incredible film from Patricio Guzman. It’s a haunting documentary that explore the events that lead to one of the most horrific uprisings in world history as well as the division in a country that nearly destroyed it. In the end, The Battle of Chile Pt. 2: The Coup d’etat is a sensational film from Patricio Guzman. Thanks. Your writing on this is awesome.